For many years, I wore a uniform to hide myself away from the world. A plain black midi skirt, a plain t-shirt (with at least cap sleeves), full length leggings. 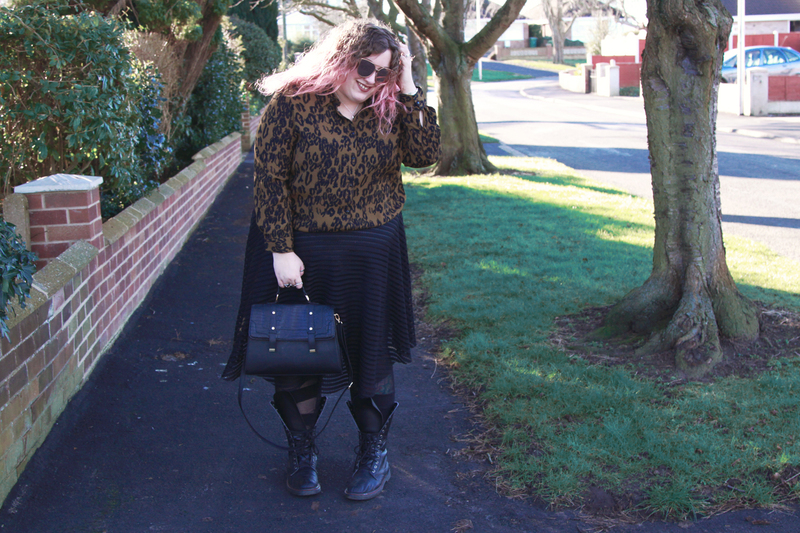 The midi skirt was essential to this uniform, it was the basic that I felt more comfortable in. Well, really it was the only thing I felt comfortable in. When I began to finally experiment with my clothes, skirts were the first thing I ditched. No more comfort zone, no more skirts. They were too easy and familiar. Until recently that is, when I fell back in love with the midi skirt. It's a classic for a reason, and I've been slowly sneaking them back into my wardrobe, just in more fun ways than the plain black I always used to wear. This mesh striped affair is one of the best pieces I've bought in ages, it's so comfy and it can be dressed up or down, and the mesh is just the right amount of rock and roll for me to feel like me. This time round, the skirts are brighter and more attention grabbing. They have prints and are the statement piece in a whole outfit. They can be comfortable, but they can also be so damn cool. 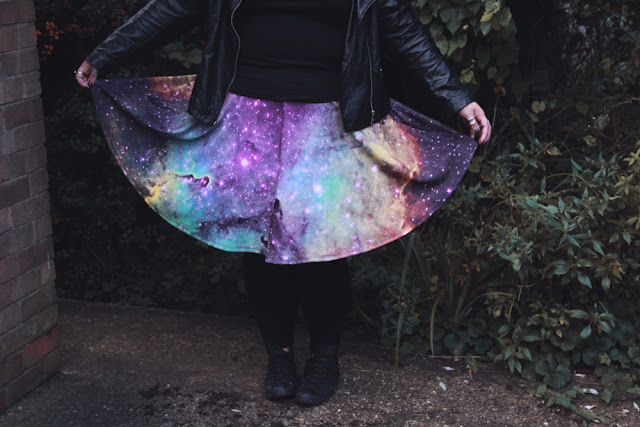 I'd always wanted a galaxy print skirt, but could never get one in my size, so while this skirt fitted the comfort zone in terms of the style, the print really did not, and it had to be mine! I stuck to black because it's supposed to be the colour that hid you, my bottom half is my biggest, so black it always had to be. No more! And even more fun, the tutu! It's become an iconic item in the plus size world now, and I can totally see why. They add instant glamour, or adorable fun depending on how you style it. I love this purple one, it makes me feel like Lumpy Space Princess! I avoided midi skirts for so long because it felt almost like I was giving in, going back to those scared ways I used to have. But in reality, I wasn't. Yes, I'll always feel comfy in a midi skirt, but I'm also not that scared little girl anymore. Instead of covering myself with full length leggings and plain prints, I bare chubby knees and fat arms with glee, all in my favourite style of skirt ever. Now, if only I could find a good pleated midi skirt to add to my collection, then I'd be happy! That rainbow skirt looks awesome! One day I'll be able to get something like that for my daughter! I love skirts - of all lengths and sizes. I'm glad you're falling back in love with them as you look amazing in all of these outfits! I have the Pleated pu midi from Elvi - it's long for a midi as well so perfect for you! I live you in skirts btw. I understand why it was important for you to break away from them, but you do look great in them. I still want that striped one and now I'm crushing on the galaxy too!